No matter how clean with think our homes are, they are still teeming with bacteria that live on every surface, near and in toilets, sinks, showers, baths, in carpets, on pets and in and on the people who live there. Most of the bacteria in our local environment do no harm at all and there is an old saying that 'everyone needs to eat a bit of dirt'. There may be some truth in this as the constant exposure to bacteria helps to keep our immune systems on alert, ready to go into action if pathogenic bacteria or viruses come along. In the home, there are some danger areas and it is sensible to take steps to avoid illness by following simple strategies for personal and food hygiene. Throughout history, people all over the world have considered toilets far too insanitary to have inside the place where they live. The Romans had communal toilet blocks away from the places where they bathed, slept and ate. In the UK, outside toilets were still the norm 80 years ago, with many families sharing just a handful of toilets in the back to back terraces in large towns and cities. Today, we think that toilets in warm bathrooms inside the house are much better than going down the garden on a cold night, but it does mean that some precautions are necessary to avoid the spread of potentially harmful bacteria. Bacteria such as E.coli, the Bacteroides species and many others make up the rich bacterial population found in the human intestines. Many bacteria find their way out of the body every time faeces are passed. It is therefore important to ensure that toilets are always flushed and hands are always washed after visiting the toilet. If someone in the house is ill with a stomach upset, this becomes even more important to prevent the bug responsible spreading to other members of the household. Bleaches and commercial cleaners kill bacteria very quickly and should be used to wipe the toilet surfaces, including the handle, and to clean the toilet bowl regularly. And it is important not to forget the area around the toilet, particularly the floor just in front, where spills can happen. Any environment that is warm and moist is an ideal place for bacteria to breed and establish themselves. Bacteria can live quite well in shower trays, wastes, plug holes, under taps, in overflow channels and on damp toothbrushes, flannels and sponges. 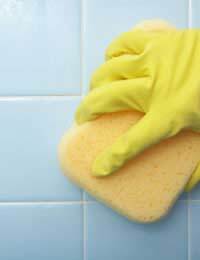 A sure sign that bacteria have begun to make a home in the bathroom is the appearance of unpleasant, fusty smells. As well as bacteria, moulds also grow well in these conditions, alongside bacterial colonies. Changing flannels and toothbrushes regularly, and washing them in hot soapy water every day can keep them fresher and regular cleaning keeps the bacteria to safe levels elsewhere. Damp cloths are also a bad idea in the kitchen but most of the bacterial dangers there come from food. Raw meat can easily become contaminated with bacteria, and chicken is notoriously bad. A few years ago there was a big scare in the UK because chickens produced by intensive farming methods were found to be infected by Salmonella bacteria, which remained live and capable of causing food poisoning. Raw chicken should still be treated carefully, although all British chicken should now be Salmonella-free. The surfaces, knives and chopping boards used to prepare raw meat should be carefully washed in very hot soapy water, and separate boards should be used for raw meat and cooked foods to prevent cross contamination. Other danger spots in the home that usually house a lot of bacteria, some of them potentially nasty include the rubbish bin and the floor and walls around it, pet bowls and cat litter trays and potty training equipment if you have toddlers. Objects that are handled a lot also have more bacteria than tabletops and furniture. The TV remote control and telephone handsets are a case in point. However, the important thing to remember is the vast majority of the bacteria on furniture and everyday objects are harmless. There is little point in struggling to sanitise your entire home in the hope of reducing bacteria to zero. Your skin is teeming with bacteria, your gut is full of them and they are essential to human existence. It makes sense to take precautions to eliminate or avoid pathogenic bacteria or food poisoning, but no sense to become stressed out just because bacteria exist.